The temple holds extraordinary significance to the rich cultural heritage of the country and in specific, the district of Pune and is symbolic of India’s historic and vibrant art of rock-carving. This unusual underground temple, in fact houses a rare sanctum, believed to be completely carved out of basalt rock, one of the few such remaining structures in the world. Accordingly, to preserve and protect this rare and rich national heritage, the cave temple is listed as a nationally protected monument under the Ancient Monuments and Archaeological Sites and Remains (AMASR) Act, 1958. Q. Why should I be worried? A. The Pataleshwar Caves is a very old monument, dating back to the 8th century. The temple houses many incomplete carvings which archaeologists have estimated, could possibly be because of a fault line found at the back of the sanctum sanctorum, which made further sculpting unsafe. The Grade Separator, being a massive excavation cannot be neglected, especially due to its dangerously close proximity to the monument. While there had already been reports of pipeline burst at the site due to callous work, the construction of the grade separator itself could prove to be hazardous to the safety of the monument. The draft heritage bye-laws prepared for this monument by INTACH warn against any excavation and road widening activities near the monument. It states that the large scale excavation in the prohibited zone will disturb the strata, as also the generation of noise and the vibrations it will create on the ground in its operational phase, thereby threatening the cave. Against the backdrop of all of this, the PMC is carrying on the construction work of the grade separator in full force. Q. What is this “prohibited area” and why is this construction alleged to be illegal? A. A prohibited area is the area around the protected monument that begins at the limit of the monument, extending up to a limit of 100 meters in all directions, as defined by the AMASR (Amendment) Act. No construction, including any public work or project essential to the public or other constructions, is permissible in any prohibited area, irrespective of whether or not it will cause any damage to the monument. This rule being stated quite clearly and unambiguously in the Act has been brazenly violated by the PMC who is constructing this disputed grade separator right inside this 100 meter boundary of the monument. Even after being warned by the Archaeological Survey of India that any construction in the prohibited area was illegal and must immediately stop, the PMC carried on construction in utter violation of these orders. 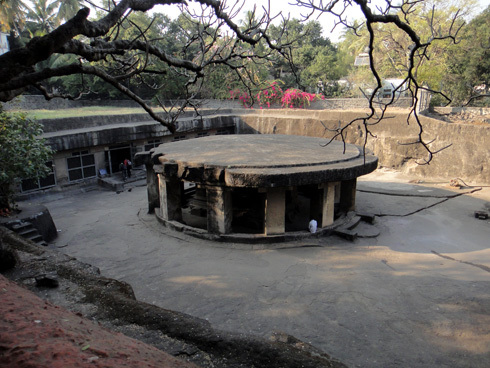 Even the ASI Mumbai circle which is the authority in charge of the monument erroneously stated in a letter to the PMC that an NOC could be obtained for such construction by submitting an application to the National Monuments Authority by showing that no harm will come to the protected monument, despite it being clearly stated on NMA's own website FAQs that no such construction is permissible in the prohibited area. Recently, the PMC has been granted an NOC from the NMA purportedly on the grounds that construction of the grade separator is not construction, as it does not involve any structure above the ground. Parisar has filed a PIL in the Bombay High Court challenging the grant of the NOC. Q. Is the grade separator required there? A. The proposal for construction of such grade separator does not even figure in the Comprehensive Mobility Plan (CMP) for Pune, which is the strategically planned blue print of the city’s transport, prepared by the PMC as per the directions of the Ministry of Urban Development, Government of India. This clearly indicated that the grade separator is not a necessary requirement. Moreover, the CMP itself expressly warns against such flyovers/grade separators as being merely short-term solutions and largely ineffective for solving the city’s traffic problems. Parisar too has time and again reiterated this and opposed any kind of construction that does not figure in the CMP, insisting on the following of the CMP in its entirety while taking up any transport project. Parisar has also stressed on the fact that flyovers and grade separators are completely contrary to the principles of sustainable transport as envisioned by the National Urban Transport Policy and the city’s own CMP whose basic idea is based on the notion of moving people and not vehicles. Flyovers and grade separators, having been made only keeping the conveyance of vehicles in mind, help relieve congestion only temporarily while allowing a lot of suppressed transit demand to come on to the roads. This will only lead to increase in the level of traffic. Additionally, the CMP recommends a thorough evaluation and analysis of alternative options before taking up such constructions, whereas no such studies were conducted by the PMC for this grade separator. A Techno Economic Feasibility Report and an Environment Impact Report had been directed to be prepared for the project by the estimate committee of the PMC. But no such reports were prepared and the project was conceived in a completely arbitrary manner without any basis or justification. Q. Why should I, as a common citizen be concerned about this? A. Because it isn’t just about one law that has been broken, but the implications that it would cause. The construction of the grade separator would leave behind a dangerous precedent that the law of the land is not above the government of the country. It could open the flood gates for such illegal constructions being built, not only disrupting the beauty of the monument but which could also pose a possible threat to the monument and consequently, the rich cultural heritage of the country. Parisar was also disappointed at the lack of transparency that was revealed in the whole process. The illegality of this whole matter would not have come to light had the contents of one letter from the ASI official to the PMC warning against the construction of the grade separator not become publicly known and widely reported in the media. The NOC for the construction of the grade separator which ought to have been displayed on the concerned authority’s website according to the rules set down by the AMASR Act was not made available to Parisar even after filing an RTI for the same. This only emphasizes the lack of transparency and accountability in the functioning of the Government, which everyone as a responsible citizen of this country should be concerned about.